We now found ourselves at Almond Biscuits in the Edmonds Cookbook index. Almond Biscuits, as a category of baked good, enjoy a little more history and reputation than I had suspected. The internet informs me that these popular biscuits are “prepared in different ways across various cultures and in various cuisines.” Versions of almond biscuits are found from China to Norway, Spain and Turkey. Who would’ve thought? New Zealand, not to be outdone, has its own Almond Biscuit and of course, where else would you expect to find this but New Zealand’s baking bible, the Edmonds Cookbook. The first thing that caught my eye as I read through the ingredients were the blanched almonds. 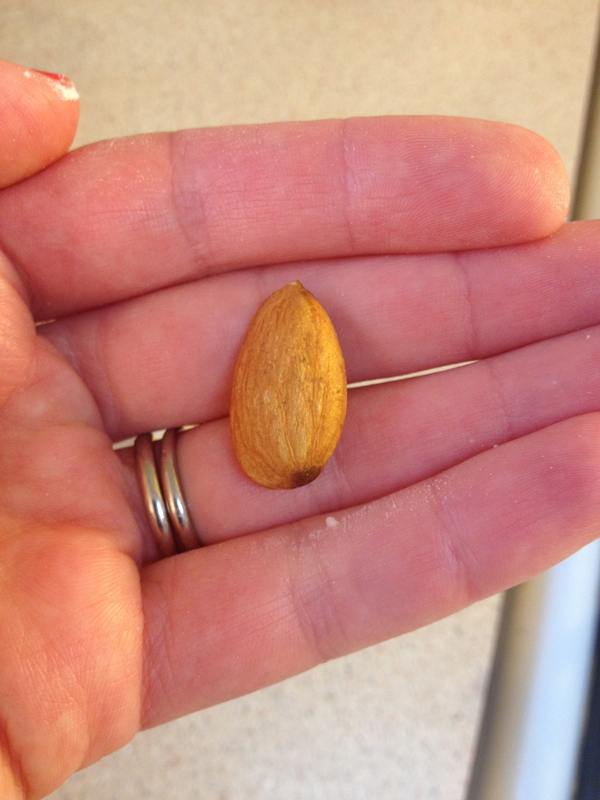 I realised that although I know what a blanched almond looks like and could pick one out in a line-up, I didn’t know much about how they got this way. Hurrah, another educational opportunity presents itself in the space of one blog post! The internet to the rescue again….blanched almonds are made through plunging the unsuspecting almonds into boiling water, then after a timed interval, plunging them into icy cold water to halt the cooking process. This softens the almond skin, meaning it can be removed. 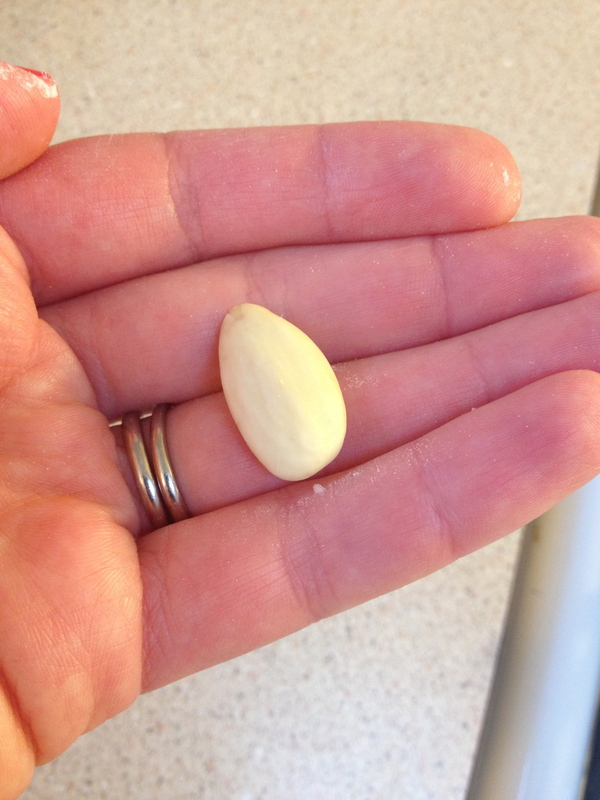 For your educational benefit, please see below a blanched almond compared to its unblanched cousin. The naked one is the blanched one, and the one with its clothes still on is unblanched. Anyway, on with the baking. The best thing about many biscuit recipes is that they start with my old favourite, creamed butter and sugar, and happily Almond Biscuits begin by creaming the butter and sugar. 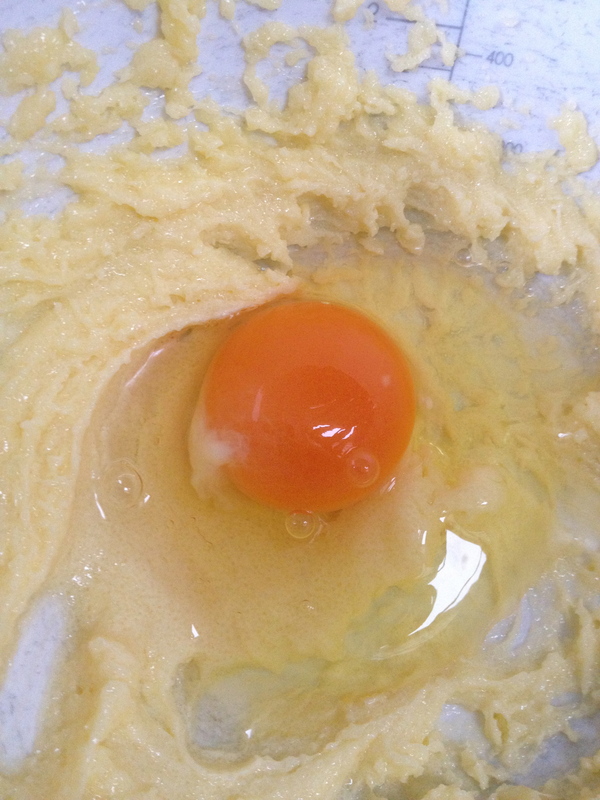 Then, in goes the egg. I bought these lovely free range eggs from our Harbourside Market – don’t they have such a beautiful orange yolk? The almond essence goes in at this time too. Confession – personally, I’ve always been a little mistrustful of almond essence as it smells a bit like loo cleaner to me. But dear readers, I’m not about to let you down. Personal misgivings aside, in it went. One beats well and then sifts in the flour and baking flour, mixing to a firm dough. Then the mixture is rolled into balls. 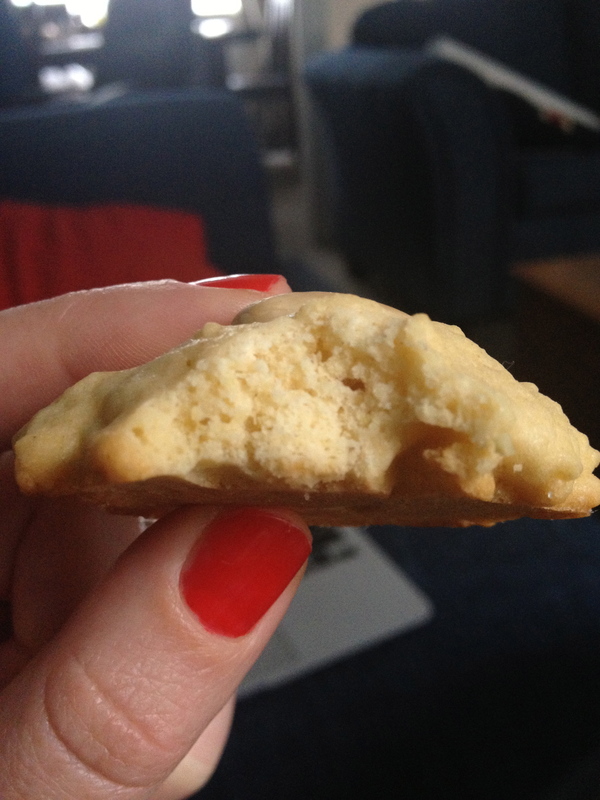 Time now for my second confession – I’m not a terribly consistent biscuit maker. It was at this point of proceedings this fact came home to roost. My mixture was a little too soft to be rolled into balls. I added a bit more flour and put it on the greased tray, not really in balls, more in lumps. I’m not sure why this happened, but it will certainly be me, and not the glorious Edmonds. 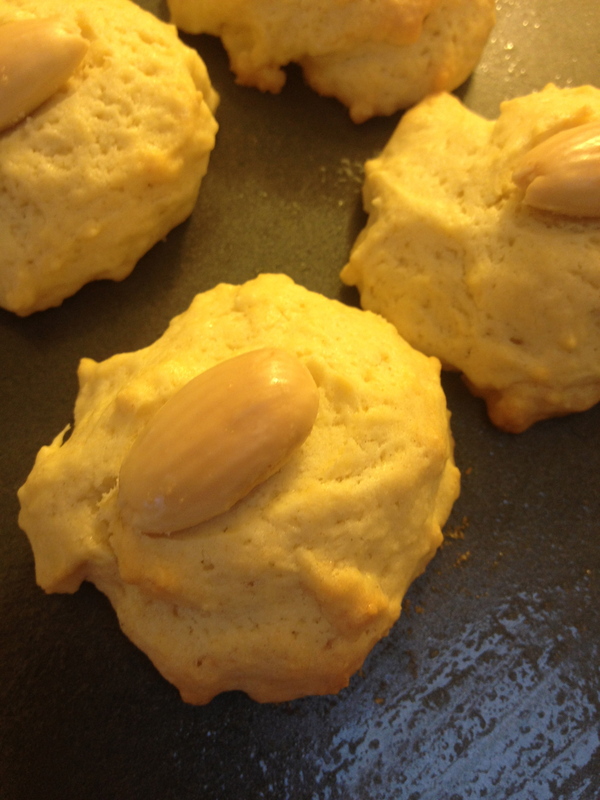 Half a blanched almond is pressed into each biscuit before baking. If you can figure out how to half one of these things without losing a finger in the process, let me know. I couldn’t, so the almonds went on whole. They are baked for fifteen minutes at 180 degrees celsius. I watched anxiously, feeling a little fearful they would remain funny little lumps with a blanched almond perched atop. They baked up well enough however, and once cool enough, I snaffled one up for testing. Mine were quite cakey in texture as demonstrated below, when I really suspect they are meant to be quite crisp. But not all was lost at all, and I’m pleased to report that taste really quite lovely, sweet and subtle, and perfect with a cup of tea on a rainy Sunday afternoon.